Like many things in life, the importance of something is never truly appreciated until it is gone. If you've lost your teeth, whether due to tooth decay or gum disease, you surely understand. The good news is that you have options to replace them. 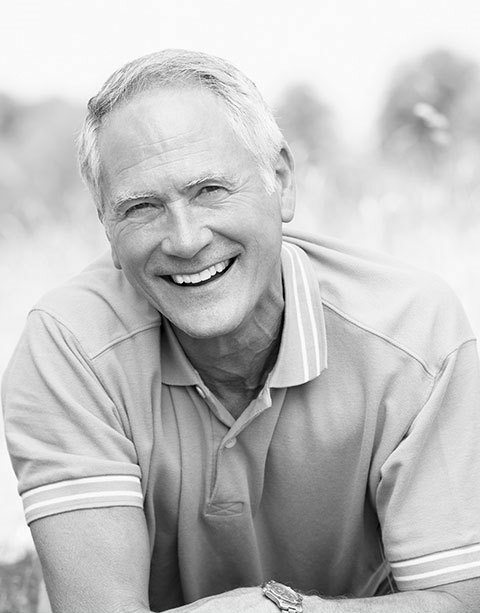 Our Cosmetic partial dentures can help restore your way of life by helping you with day-to-day functions, such as eating and speaking, as well as helping restore your confidence by improving your appearance and smile. Making a denture is a process that usually takes about 4-5 visits , however this can vary from one patient to another. 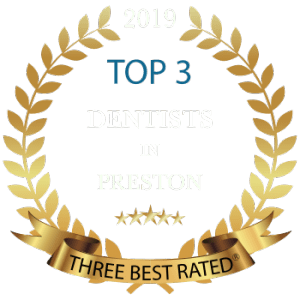 Experienced Cosmetic dentists at Lane Ends Dental Practice are dedicated to producing only the highest quality results in Restorative and Cosmetic Dentistry. Our clinician, Dr. Tehranian is at the forefront of cutting-edge dental developments, incorporating the latest dental technology and clinical research into our treatment approach to provide you with attractive, functional and long-lasting solutions. We consider an overall approach or “big picture” when treating our patients - this means we take your facial appearance, smile, speech and function into account as well as your teeth and gums. Designed to correct the gaps in your smile, when only some of your teeth are missing. Conventionally, metal attachments were used to anchor the dentures to your natural teeth. However, there are many other alternatives such as tooth and gum coloured attachments for aesthetic areas. Partial Dentures maintain tooth alignment by preventing your remaining teeth from shifting. 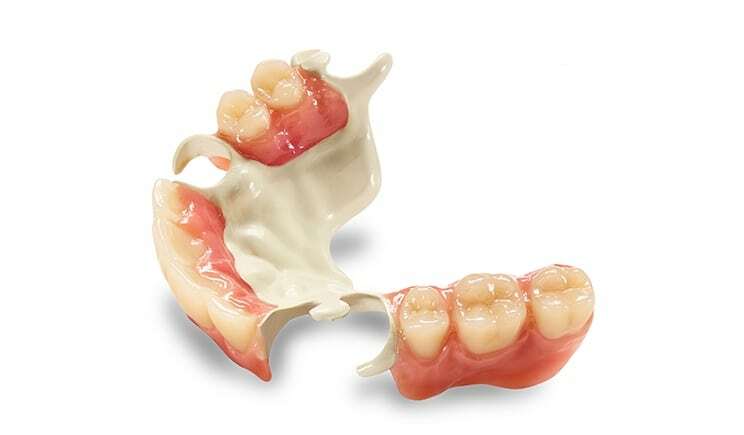 Our Premium dentures are very high in natural appearance. 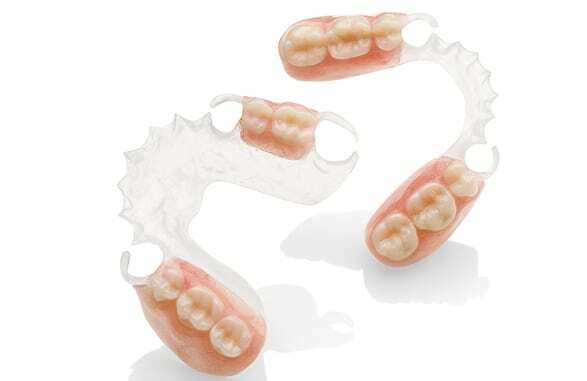 They are made using premium-quality denture teeth, which are impact, wear and stain resistant. As with all our cosmetic dentures the teeth are first set in wax for you to try in. Changes may be made at that time. After you have approved your new smile, the laboratory will custom finish your denture in the permanent acrylic base material. There are two main types of partial dentures: fixed and removable. The health of the teeth surrounding the gap is the determining factor what type of partial denture is right for you. A removable partial denture is also known as a removable dental bridge. A removable dental bridge fills the gap between two healthy teeth and consists of replacement teeth attached to a gum-coloured plastic base. 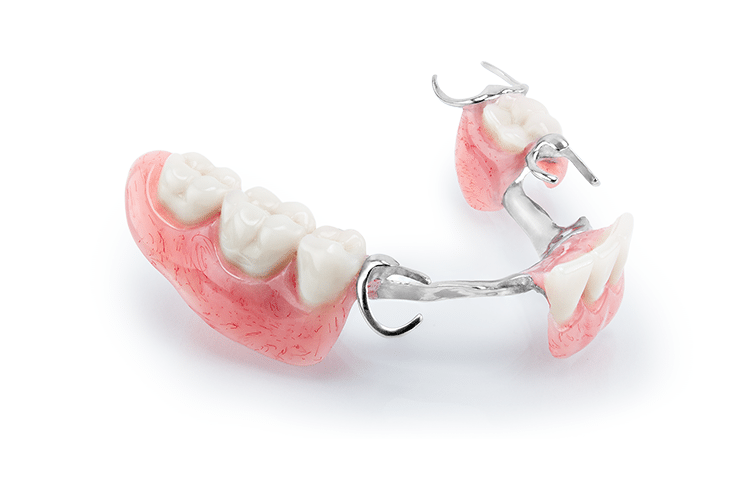 Removable partial dentures are connected by a metal framework that helps to keep them in place. 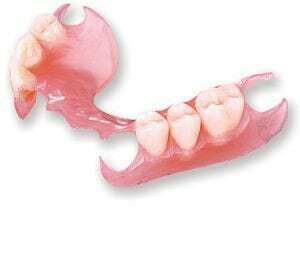 We offer several types of partial dentures – Chrome (metal dentures), flexible and acrylic. The chrome and flexible partials are our best partials. 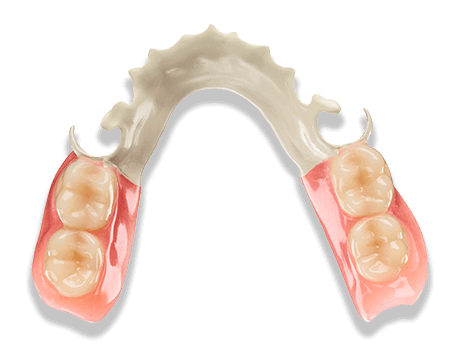 Chrome partial denture is stronger, less bulky and offers a great fit. This partial has a metal framework to which will attach higher-quality denture teeth. The flexible partial Denture (Valplast Denture) is made from a special material that gives you added comfort and fit. It is very flexible and doesn't break . If you experience discomfort from an acrylic or cast metal partial, or if you are allergic to acrylic, a flexible partial denture might be a better solution for you. Made from a thin, heat sensitive type of plastic, a flexible partial denture is both comfortable and highly natural in appearance. Flexible partials are attached with thin, gum coloured composite clasps that fit into the natural spaces around your teeth. Acrylic partial dentures are more affordable, but they tend to feel slightly more bulky. This partial has an acrylic base into which the denture teeth are set and is attached to your natural teeth with small metal clasps. The acrylic partial may be available with more durable, natural-looking teeth, organic acrylic gums. Partial dentures are a less-invasive option that also tends to be less expensive than other options for replacing missing teeth. Partial dentures are an appropriate solution when the other teeth in your mouth are healthy with no gum disease. It is always preferable to keep your own natural teeth, however, if this is not an option, full acrylic dentures may be the right solution for you. If you are looking for metal free partial dentures, it’s time to discover, the new high-performance polymer removable partial dentures. This custom-formulated polymer has been engineered to replace metal as the material of choice for removable partial denture frames. If your teeth have reached the point where you are considering dentures, we invite you to come in for a consultation. We will do an assessment of your condition and provide you with a list of options tailored to your individual needs. With the advances in dental implants and other techniques in the last twenty years, dentures can often be used in conjunction with implants for enhanced function and comfort. However, for many people dentures alone are a very cost effective solution to the problem of ageing teeth and gum disease. Suffering from loose or ill-fitting Partial dentures?